RV.Net Open Roads Forum: Anyone interested in 83 Pace Arrow Tear down and Rebuild? > Anyone interested in 83 Pace Arrow Tear down and Rebuild? My windows were made by Hehr. 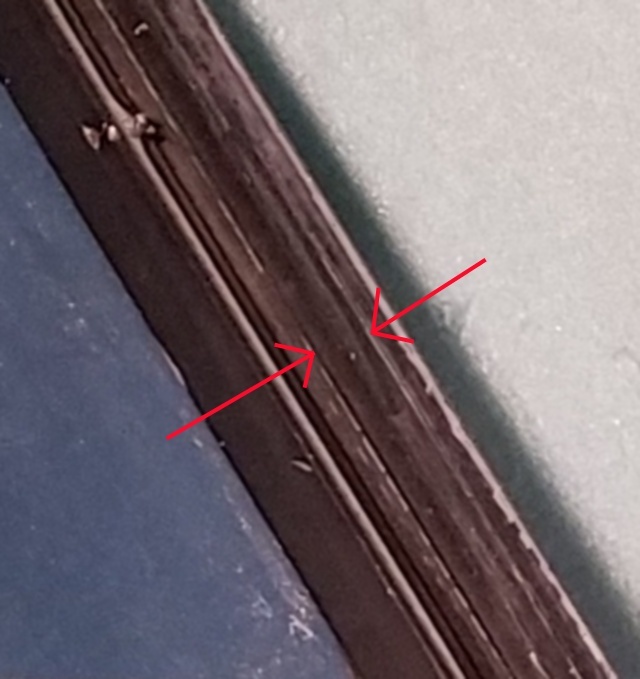 The glass was not glued to the frame but rather was secured with a double stick tape. Kind of like the tape they use to put emblems on cars now. The rubber gasket can be replaced without taking the frame apart. It can be pushed into place with your fingers and a plastic putty knife. Prefer that to metal as less likely to damage the glass. If you re-film the glass, make sure you get a ceramic tint film instead of the metallic tint film. The metallic tints can interfere with cell phone signals. Glue may have been an incorrect term. Either way, the window was mostly still "stuck" to the frame with whatever they used. Whatever it was, it was not exactly fun to remove. Very sticky stuff. I was not aware there are different types of window tint films. I will make a note of that. Thanks for the information. My cell phone will be happy! If you want to do something, you will find a way. If you don't, you will find an excuse. A lot of experience, comes from bad judgement. 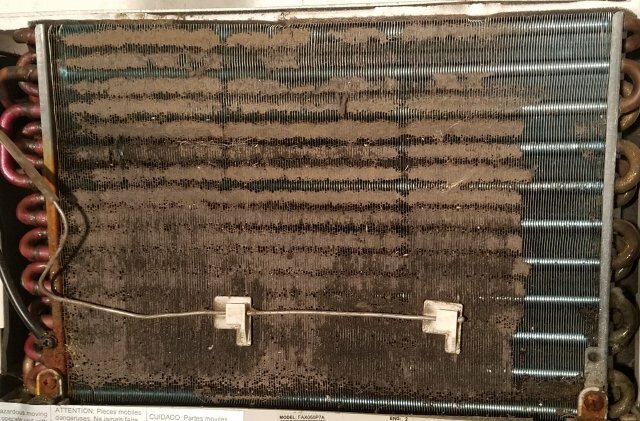 Ya know, it's amazing how much additional air flow will go through an ac after you clean the gunk out of the coils! Lol. Yes, it had a filter on it just in front of the coils, so, I dunno. Somebody had borrowed this, and I didn't check it when I got it back, until today. Maybe they ran it without a filter, I don't know. Either way, after cleaning the coils, definitely more air flow! I started cleaning the drivers window window today. 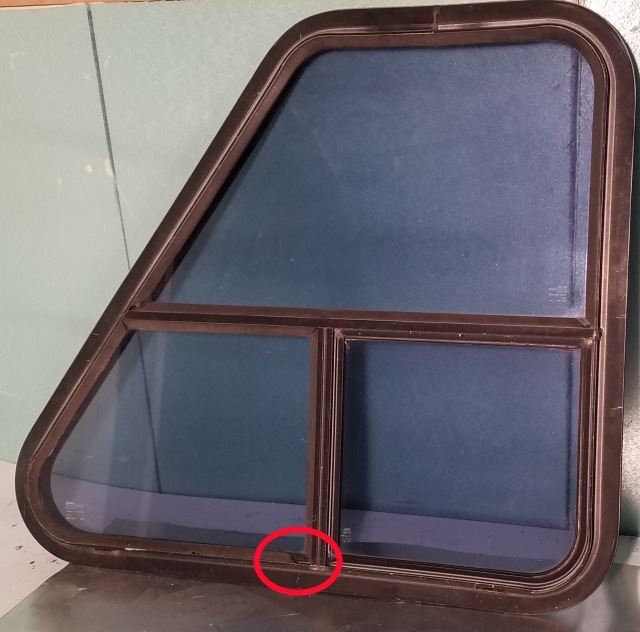 Here you can see the red circle showing that the rubber gasket has shrunk somewhat. 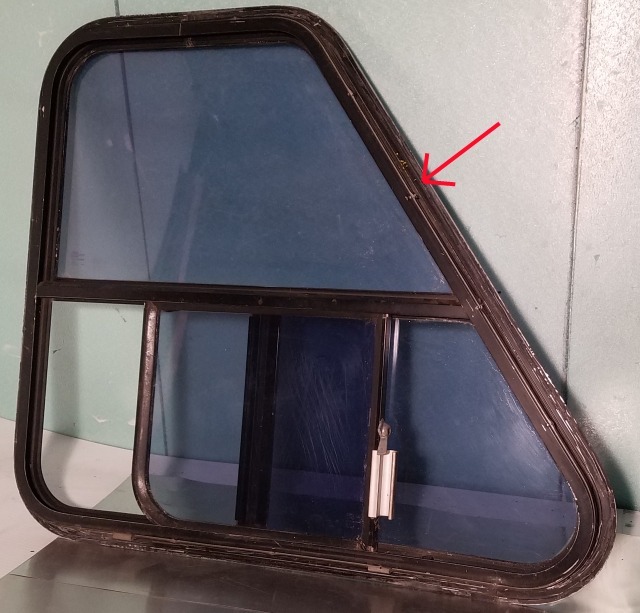 As with the other window, it didn't leak, as the adhesive between the window and frame is on the inside. Here is the inside of the window. The red arrow points to an area that is recessed in the aluminum. There is a better view of this area in the next pic. Not sure how well this will show up, but this is the close up showing the recessed area in between the 2 arrows. This is where the sealant was applied and then the window was inserted from the outside of the wall. When the screws are installed from the inside, it pulls the window inward, and the sealant flattens out and supposedly, seals the gap. Took the day off today. We had a major rain event, (shocking, I know), so I decided to just take it easy for a day. As I type this, the weather man is telling us that during the course of the over night hours, there is another major line of thunder storms and high winds coming through. Probably about 2 - 3 am or so. Guess we'll see if it wakes us up. Should have a better update tomorrow. Working for my niece was changed to Tuesday this week, so I should be able to get something done tomorrow. Yay! You know the really cool thing about working with cordless tools? When the electric goes out/off, it doesn't matter. You just keep on working! Yea, that happened today. I win! Lol. I bought a piece of plywood today, to get ready for putting the pilot and copilot windows back into place. More on the spreadsheet update later. 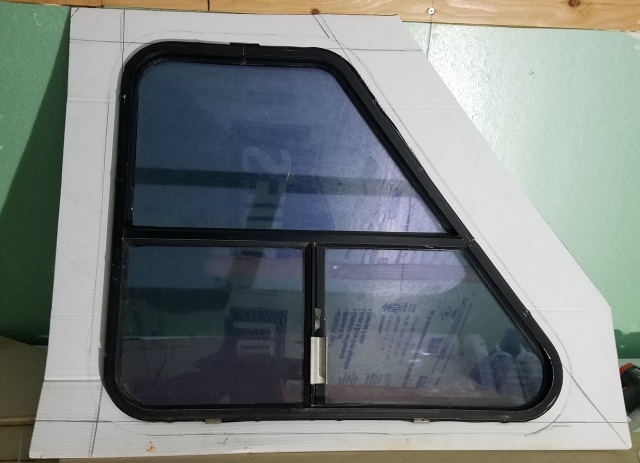 First thing I did, was to use the coroplast pattern I had made to fit the wall area, was then to cut the pattern to fit the window frame. 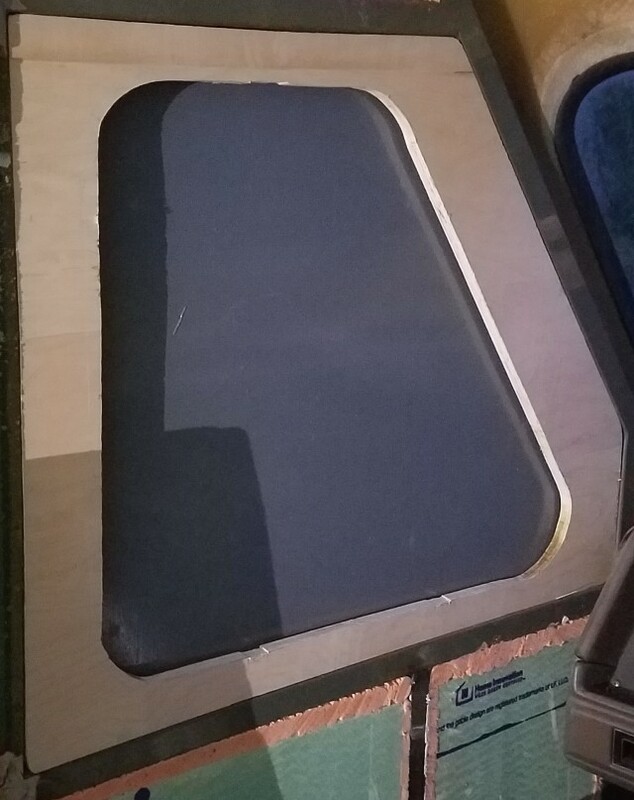 Next was to transfer the coroplast pattern to the plywood, and then cut it to fit the framed in area on the pilots side.